You may never thought of whiten your teeth with turmeric as I do because of its yellowish color. There are many ways to whiten teeth such as the baking soda remedy. I heard from my friends that turmeric is an useful spice and herb in traditional Chinese medicine, it can help boost immunity system, help losing weight, control diabetes and even prevent cancer if using it for long. 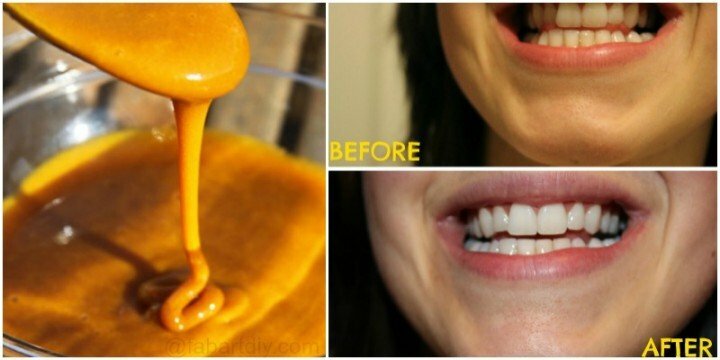 At first glance, most of us will think turmeric stains teeth and it does, but this exotic anticancer spice helps whitening teeth was proven by many of us. Instead of spending dozens even hundreds of bucks on all those over-the-counter tooth whitening products. We can use this easy, inexpensive and most of all safe way to using turmeric powder which can not only make the teeth white but are perfect remedy for various gum diseases. Damp the toothbrush and soak it in turmeric powder. Rub the teeth good, like a normal brushing and don’t rinse it with water instead the leaves orange turmeric paste to act 3-5 minutes. Rinse well and wash your teeth with your usual toothpaste. Some people observe spontaneous teeth whitening effect, while for others it takes more than one application for visible results. theprimitivehomemaker (image above) show us her effective result after trying.